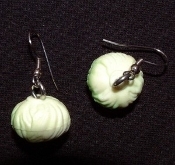 Mini Green Funky Irish CABBAGE EARRINGS - Realistic Miniature Rubbery Plastic Lettuce Garden Vegetable Food Charm - Approx. 3/4-inch (1.88cm) Diameter. Great with Corned Beef and Irish Potatoes for St. Patrick's Day. Fun lucky money jewelry!